On or Off Campus: How to Decide - SchoolFinder.com! Moving is tricky. Deciding where to move is trickier. That’s why we wanna help. It’s your first year of post-secondary education and you’re not sure whether to live on or off campus? That’s a tough call. Good thing we weighed the pros and cons for you! Check out this list if you’re feeling a little torn. Moving away from home can be overwhelming. Staying on campus can offer some peace of mind. By the end of your second week, you’ll know the campus like the back of your hand; being close to something you’re familiar with can be really comforting. This means you know how long it takes you to walk to class (meaning you might even be able to sleep in). Living off campus means exploring a whole new life and neighbourhood. Living in uncharted territory is an adventure. You might have to commute to get to campus but that’s just another excuse to discover something you might have otherwise missed. Living on campus means you’ll be close to your best buds at all times. It means you’ll never be alone and even if you are, you’ll never be lonely. Residence staff match like-minded students to support positive cohabitation. It’s easy to make friends! On campus residence is the greatest thing to ever happen to a social butterfly with events and leadership opportunities planned throughout the year. Whether you’re a bit more reserved or like being around people, this might be the place for you. Living off campus means fending for yourself. Sure, you’ll get to know people in your hood, new classmates or roommates, but for the most part, everyone around you keeps to themselves. It’s a bit harder to make friends when you don’t already share a common living space. However, this lifestyle might be easier for you to study and reduce stress if you’re not used to a slightly busier lifestyle. Some students seek housing in all-inclusive, off campus apartments like this one or this one. Rather than paying various bills, these guys come as a package deal. From communal kitchens, to lounge and study areas, all-inclusive housing is appealing. It’s got many of the advantages of living on campus, despite not actually being on campus. Residence is also all-inclusive. 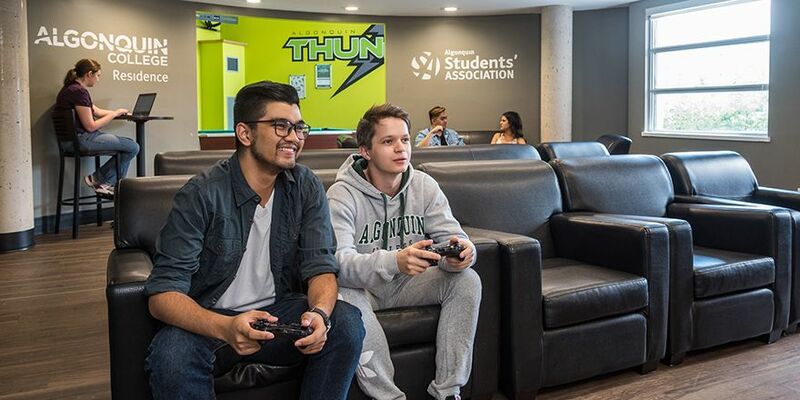 At Algonquin College, you only pay for your room from September to April so you won’t be locked into a 12-month lease – but if you’re there for a 12-month program, you can stay through the summer too. Enjoy an array of great food options with nine food locations on campus (35th Street Market Café located right inside Residence has some great grab-and-go items). On-campus Residence also offers spacious rooms and a variety of common spaces, including a games room, movie lounge and fitness room. If you aren’t living in an all-inclusive apartment, you’ll have a lot more responsibilities. You’ll have to decide whether you want to live with roommates or on your own. You’ll need to figure out how to get to and from school (luckily all full-time Algonquin College students are eligible for a U-Pass). You’ll likely be paying various bills at once. First steps in #adulting. Consider the cost of rent, heating, hydro, gas, parking, laundry, furniture, cable, and Wi-Fi. We promise, we’re not trying to scare you. With cost sharing between roommates, this option is surprisingly most often the cheaper lifestyle. We know it’s a hard decision to make. There are so many different things to consider. Just know that, regardless of where you end up living, you’re going to be just fine. This is a whole new adventure so start exploring, friend!